From 3 to 21 January 2017 SEW staged​ its second Learning Event, expanding upon the first in 2016 whose topic was unsettlement. Unsettlement is evidenced in growing prison populations as well as the incarceration of people forced to leave their homelands due to population pressure, rapid urbanisation, conflict and climate change. This Learning Event would consider youth detention, with particular focus on Tasmania; refugee camps worldwide; and re-use of an abandoned prison building in Ibagué, Colombia. International participants and educators came to the University of Tasmania’s Inveresk campus to advance their knowledge, practice and ideology. Students from Harvard, Parsons School of Design at the New School, University of Brighton, Griffith University, University of Melbourne, and the Royal Melbourne Institute of Technology took part; educators included Elizabeth Grant (senior research fellow in criminology at the universities of Adelaide and Cambridge), Shana Agid (Assistant Professor of Arts, Media, and Communication at Parsons), Mahmoud Kershavarz (Researcher, Malmo University), Stephen Loo (Director, Creative Exchange Institute, UTAS) and Michael Hornblow (Senior Lecturer, UTAS School of Architecture + Design). During the first week, Tony Fry addressed a range of issues as background to group projects that were discussed in weeks two and three. The issues included: the increase in incarceration numbers while crime rates decrease; privatisation of prisons and the prison industrial complex; prison conditions and demographics; prison architecture and history; self-imposed imprisonment within gated communities; akrasia regarding omnipotent surveillance; crime and culture, crime and colonisation; the criminalisation of movement; and refugee camps and detention centres as places of arrested transformation. 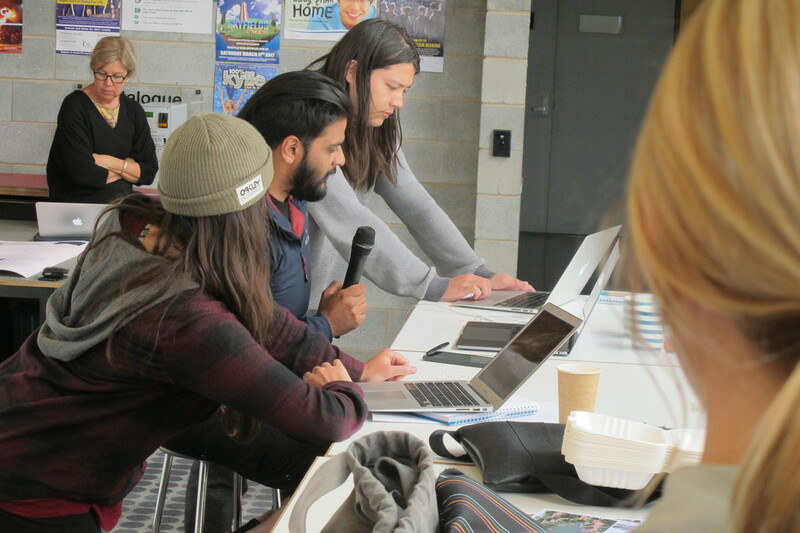 Shana Agid, via Skype, talked about critical resistance, providing examples from his work in the United States; Mahmoud Kershavarz, also via Skype, summarised his research on undocumentedness and attempts in Sweden to overcome this state; and Elizabeth Grant gave an in-depth illustrated review of prisons in Australia. Tony challenged his audience of 16 members to be redirective practitioners who thought about alternatives to alternatives and were cognisant of the full ramifications of design that keeps on designing. Worldwide, the numbers of people compelled to become migrants due to conflict and environmental and economic crises are increasing. Millions of people now live in refugee camps in a condition of impermanence, unsure how long they must stay, living inadequately far from normal life. Australia compounds these circumstances in off-shore detention centres of extreme isolation. Refugee camps are an inadequate, short-term way of dealing with forced migration. Would it be possible for a camp to develop into a more viable entity with a different social and organisational structure? The group’s final presentation was an ersatz meeting of associates who had developed ideas that would permit refugees to self-determine their housing, social organisation, occupations, economy, etc., so that their indefinite time in detention was a productive existence. The group expressed awareness of comparable solutions currently in place but were endeavouring to remove the colonial ideology that structured existing examples. With rising violence and unrest in Australian youth detention centres, there is an urgent need for an innovative approach that rethinks outdated models of youth justice. Using empty school buildings in the Hobart suburb of Claremont, participants were set the task of discovering a model that would cater to young offenders at the same time as meeting community expectations. The group’s lack of resolution to the problems mirrored the complexity of committee projects in any community. While enlightened ideas, such as the youths’ building their own accommodation and providing care for SPCA animals, were suggested, the group’s lack of consensus represented the reality of the problem of the problem. A time line of their consultations highlighted the struggle. Panoptico Ibagué was an over-crowded, cruel prison in Colombia that closed in 2000. In 2003 a proposal was made to redevelop it as a cultural centre. This proposal failed to address, and effectively concealed, the complex and traumatic history of the site, its impact on former occupants, and their communities. In Colombia, many prisons are severely overcrowded and prisoners suffer inhumane living conditions. Attempting to address these problems is made more complex by the widespread corruption and gang influence within the prison system. The group aimed to generate alternative proposals to prompt critical debate on the role of the prison by using an empty prison as a way to reintegrate ex-inmates back into society. The process of identifying the problems of and future possibilities for this former prison site revealed the complexities of redesigning to engage its social, political, cultural, technical and historical fabric. ​For the closing event, to overcome the remoteness of the problem, the group chose to serve a traditional Colombian meal as a gesture towards bringing Ibagué to a Tasmanian audience. As well, the globally-practiced activity of conversation while dining together offered a means to engage glocally. No firm decision had been made about retrofitting ‘Panoptico Ibagué’ so the group challenged the audience to extend the conversation by returning postcards or writing emails to them. ​Besides Australian participants the cultures of Egypt, Canada, the USA, Colombia, and Latvia were also represented. The first part of the event engaged the conceptual and theoretical issues of Unsettlement/Intercultural Responses. This was followed by groups working on a number of collective projects based on event themes. This followed by each participant developing their own specific project. These will be listed soon. The event culminated with a well attended exhibition by invitation of work produced over the the final two weeks. 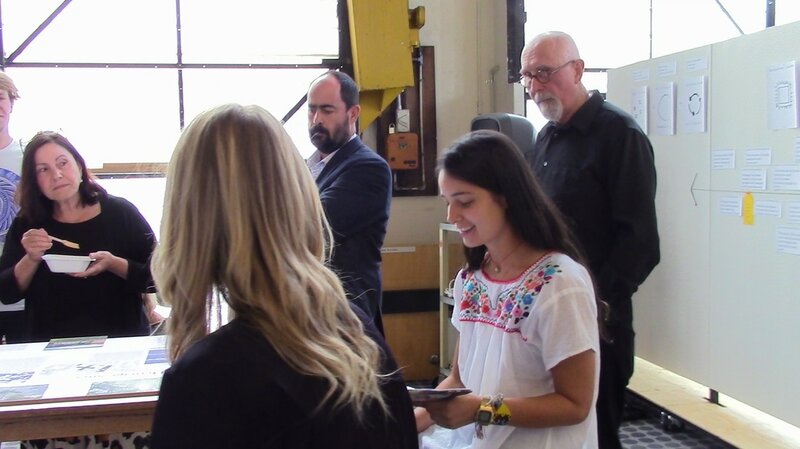 The event was led by Tony Fry with support from associates Duncan Fairfax (UK), Frances Whitehead (USA), Tim Tim Jachna (Hong Kong), Anne-Marie Willis (Egypt) and Eleni Kalantidou (Australia). Listed below are the projects that participants created to continue an engagement with the issues and interests developed during the Learning Event. They will take place within and beyond Australia. Additionally there are two more participants whose contribution to the Event: Olivia Scott and Pharan Ahtarkhavar. Unsettlement / Intercultural Responses was a challenging and immersive experience. The event continues to change what and how I see and think and I have taken from the experience much development and collaboration opportunities. Erica: An opportunity to share and inspire amongst a unique group of humans. Giving me strength to conquer my goals. D: Tony Fry's warnings about unsettlement should be heard by a wider audience. Despite the need to travel to the edge of the world, it's worth the journey. Launceston is the ideal venue for SEW: all the amenities of a small city plus world-class natural environments near by. Sasha: The Studio at the Edge of the World is an extraordinary learning event, bringing the challenges of a globalised world, to the sleepy, picturesque town of Launceston, Tasmania. Tony Fry and his associates created a convivial, dynamic and challenging studio which resulted in lifelong learning, both personally and professionally. Recommended for those with an inquisitive mind and an open heart. Gazbia: Coming all the way from Egypt, my experience at the studio was invaluable. I had the opportunity to interact and engage in cultural exchange with people from different countries - we had necessary discussions around our unsustainable human condition which were eyeopening. This experience reinvigorated my determination to develop a project that could potentially impact the state of the world we live in, even at a very small scale. It was stressful and challenging but hopeful.